(June 8, 2016) Today the Wall Street Journal is running an article titled, “Sprint’s Wireless Fix: More Telephone Poles” by Ryan Knutson. The subhead is, “Plan to improved network delayed as communities struggle with the unusual antenna requests.” The article describes Mobilitie’s troubled start building the next Sprint network, including putting in facilities without benefit of, ah, government permits. My favorite is Baltimore story where Mobilitie dropped a site into the middle of a sidewalk handicap ramp. The city wasn’t amused and filed Mobilitie $5,000 after they abated that particular public nuisance. 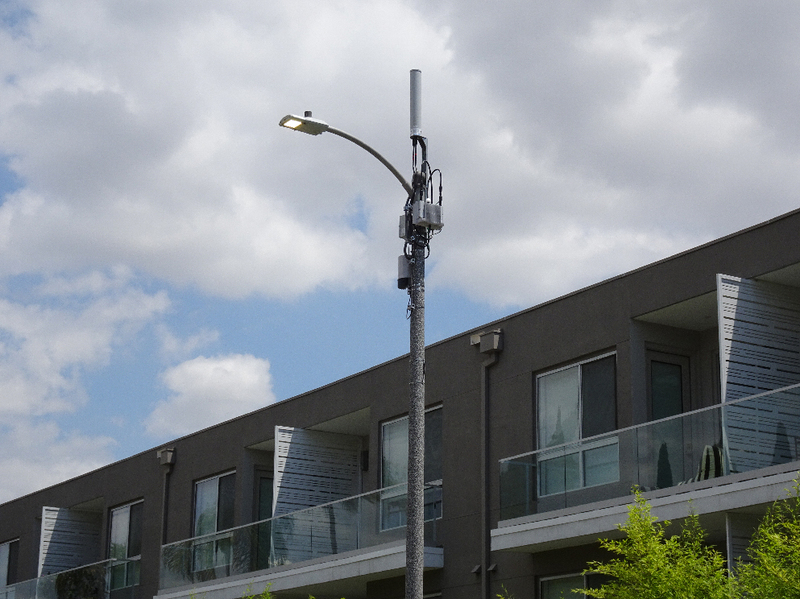 While some industry observers have dubbed Sprint’s plan to decommission many or most of its macrocell sites in favor of pole-top cell sites as “Project Network Suicide,” Sprint claims that it will cost them 60% to 70% less to deploy its new network. This rose-colored view is likely to evaporate rather quickly as these particularly ugly sites are erected and residents rebel over sites like the one pictured below. I foresee Sprint (through it surrogate, Mobilitie) filing many law suits against local governments that object to the disamenity caused by pole top installations like that shown above, or worse, to new 70′ to 120′ wood poles placed next to and even inside residential neighborhoods as Mobilitie proposes in various communities. Like the lawsuits filed by Crown Castle, I expect that the carrier-in-fact – here, Sprint – will not in the foreground so that they can be insulated from having to report those lawsuits to the financial community. Read the WSJ article, which I had the privilege of contributing to, including providing the WSJ with the Mobilitie site photograph that accompanied the article.